For the most versatile mobile floor lift, the Prism Medical FGA-450 Total Floor Lift is your most cost effective solution. All of the features and innovative designs deliver a lift that makes transfers easier and safer for residents and caregivers alike. The aluminum frame is made to offer the highest in weight bearing capability for a midsize lift, yet is lightweight and easy to maneuver. The unique quick release design for the carry bar allows for new and old style bars to be used. 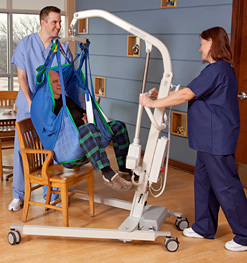 The lifting range allows a client can be lifted from the floor and transferred to a high bed and the base design offers stability and user control when navigating close quarters. 24 VDC, 10.5 Amps Max. 100-240 VAC, 50-60 Hz, 0.4 Amps Max. Standard maximum load 450 lbs. 30 lifts at 450 lbs., 10% duty cycle.